Providing the Sarasota area with professional, fast and eco-friendly junk removal services. Anyone who’s clean a bathroom in a regular basis knows that mold has a tendency to grow on shower curtains and around tubs. The best way to attack that mold is with a blast of bleach cleaner. After major storm like Hurricane Irma, the chances of mold growing has increased and it’s not just something you can spray away. Anytime water is left to dry in the human condition can create the perfect growing environment for mold. That is why any water damaged piece of furniture, carpeting or wall has to be removed and replaced. That can certainly create a major challenge for most homeowners. 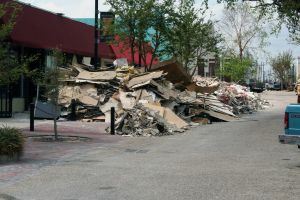 Thankfully, a company like Junk King Sarasota is standing by to spring into action and provide fast hurricane cleanup. With the hurricane fast approaching, most homeowners and businesses scramble to make sure their property was as protected as it could be. Storm shutters over windows and removing patio furniture and other potential projectiles is a good way to get your home ready for storm. It’s also important to make sure your sump pump is working properly and that you have a backup in case the power goes out (which it did). But even with the best of prep work, you cannot predict what may get dumped in your yard or how high the floodwaters will rise. The cleanup effort is underway throughout Sarasota but it could take months for the city to get everything as back to normal as possible. You shouldn’t have to wait that long. And you won’t if you hire Junk King Sarasota today. Junk King Sarasota is going to send over a pair of movers assigned to your hurricane cleanup task. This is a crew that is going to show up with a friendly attitude and who are great at solving cleanup challenges. If there’s something big or bulky that needs to be removed from your property, then Junk King is in above cutting it into pieces in order to get it onto the truck. The focus is to get all the damage stuff clear as quickly as possible and that can usually happen in a single session. When you hire Junk King Sarasota for your hurricane cleanup, it’s one less thing you have to worry about. Make that call today. This entry was posted in Sarasota Junk Removal and tagged debris, hurricane cleanup, Junk King, junk removal on September 27, 2017 by Junk King. Last updated September 27, 2017 .